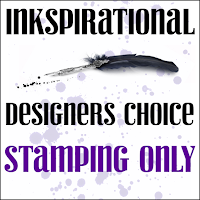 Time for a new challenge at Inkspirational and it is our Designer's choice and it is my turn to choose. Stamping Only-that is just ink and stamps...no adding dies but layers allowed! -bright and sunny colours-I am nearly sure that these colours are Lynn's fav. I love them too but my fav colours for card making are purple and yellow combo! I hope I got all these elements right Lynn and you are a sassy, classy and bad assy girl and I love you! Our Guest Designer for this challenge is Laurie-her blog Stamping Up North With Laurie is full of creative and inspiring projects-take a look around and you will see what I mean! I really hope you get some time to join in and remember...it is just stamps and ink so can be a real quick card to make. 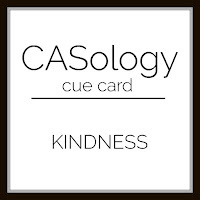 CASology-Kindness-this went to my very, very dear cousin and the words are fun but also I would like someone to say this to me....kind words and would make me feel special-hope they did you Lynn....because you are! I love this card and have it proudly displayed in my craft room! Had to move it off the mantle for the Christmas decorations! And yes...stamping only and my favorite colors! Love! Thank you! Looks mtotally like a crad you both like! Love the sunny colours on this gray day... Enjoy the weekend! LOL....cute card and a fun sentiment! What a fantastic card. Love how simple it is, and also love those fun dots. Thanks so much for playing along at CASology this week. I love that it's so personal and yet cas. I love the yellow splash behind the words. Happy New Year. I am the worst at making simple cards, so I always admire people who can do it well! And you did it amazingly here! 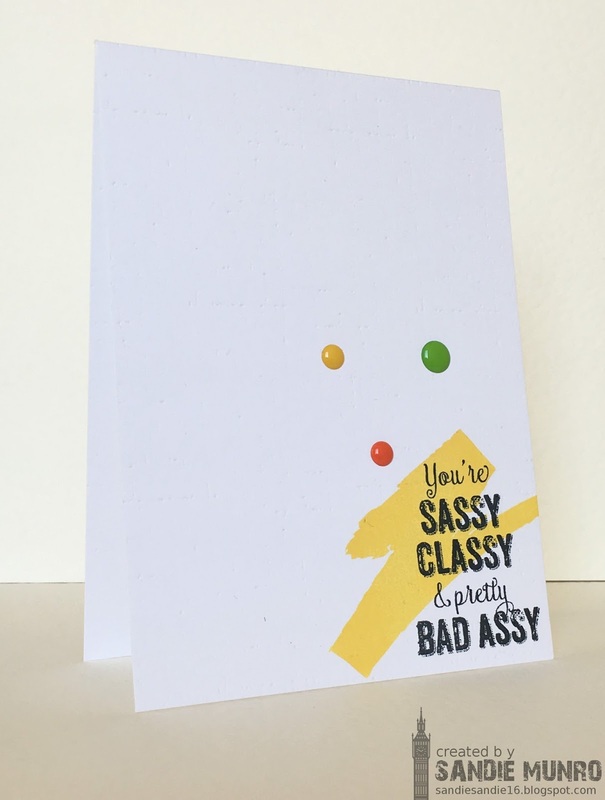 I love the attitude of this card which made me smile and I was impressed at how much oomph it has with just using stamps as the main component. You did a great job here and I'm so glad you took the time to share your talents with us for this week's Simon Says Stamp Monday Challenge! Your card is 'personality perfect' for Lynn, as you've described, Sandie! Once again, your CAS style, fabulous colour combinations, and eye-catching design are highlighted! And the sentiment: LOVE! This is a great challenge; I'm predicting a full-to-bursting gallery! It's so refreshing to see some lively, bold colors on a card again, it's a cool design! Fabulous card! Such a wonderful design!! Super fun sentiment too! Love it!! Ha! Fun sentiment! You rocked this challenge... love the yellow background stamp and there are those cool dots again! I definitely need to get some!